. . . but they’re already home, and so are we. After 24 days of rotational grazing, the livestock made an entire trip around the pasture (minus a couple of paddocks due to some strategic netting issues). The picture shows their last paddock in the rotation, one they hadn’t grazed in 5 weeks. 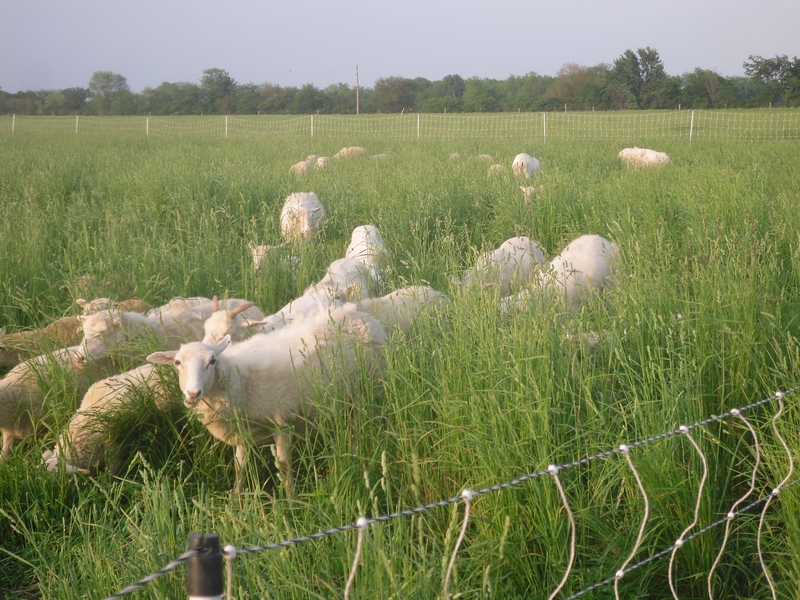 Thankfully, we have had plenty of rain and as you can see, the pasture is taller than the sheep. This total rotation is just barely enough to break the parasite cycle of 21 days. I’ll fix that though, by buying another length of netting (to make 8) so that my paddocks don’t have to share a side. This will allow me to add 2 or 3 more paddocks to the total rotation for an additional 4 to 6 days of grazing. We appreciate your business. We will be at only one market this week, the new Farm to Fork Market at Normandy Farms. The market is Friday, May 24, from 4:00 p.m. to 7:00 p.m. Normandy Farms is located at the corner of 79th Street and Marsh Road on the northwest side of Indianapolis. We look forward to seeing you.